Loving Naturals Organic SPF30 Sunscreen is made up of 100% natural ingredients, so might be more appealing to those of you that only like to use natural products on your skin. 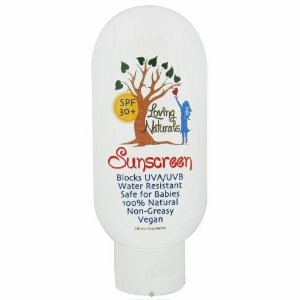 It is devised to be a water resistant and non greasy lotion that blocks both UVA and UVB rays. This in turn protects the skin from an increased risk of skin cancer and premature aging. I admire this company for the effort it puts in on its research into the ingredients used, as a lot of products can claim to be natural but when you actually read the ingredients list you can see it isn't so natural at all. Looking at Loving naturals ingredients it stands true to what it promises. I have summarized the lists below from the people using the sunscreen. Non-Nano Particle Zinc Oxide (24.8%), Grape Seed Oil, Organic Sunflower Oil, Caprylic/Capric Triglycerides (derived from Coconut Oil), Soy Wax (Non-GMO), Organic Olive Oil, Organic Plum Kernel Oil, Organic Sesame Oil, Candelilla Wax, Organic Hemp Seed Oil, Organic Macadamia Nut Oil, Organic Cocoa (Fair Trade), Organic Green Tea, Vitamin E Oil. Apply to skin at least 30 minutes before sun exposure. The majority of users relish the natural ingredients and the effectiveness of this sunscreen. They also like how it is non greasy unlike a lot of other lotions. There are a couple of people who aren't keen on the white reside it leaves on the skin and the slight smell of vegetable oil it has, although that does fade after a couple of minutes after application. It does using cost $37.99 but is on sale now for $9.10, which is a much more reasonable price.